I am adding to my armies for the battle of Bouvines and wanted to use some different banners instead of just flags. Would it be historically accurate to use a gonfalon or gonfanon for low countries mercenaries or for French civic militia units? Most images of the battle (real and imagined) tend to just show flags being used. The term Gonfalon/Gonfanon comes from the medieval Italian and their usage and maybe mercenaries with a more pan-European exposure would have been more inclined to use them, maybe not as much French militia. shows the French King and his nobles charging with a Gonfanon or something similar in present. I am uncertain whether this is based on the real event but if it is OK for the King, why not his militias. The banner in Rava's picture seems to be the Oriflamme, though he seems to have put something like an eagle on it. "As to the King, he is content to see lightly fly his simple banner, made of a simple silken cloth of bright red and in every way similar to the banners usually used in church processions on prescribed days. This banner is commonly known as the Oriflamme: it has the right to be carried in all battles, ahead of every other banner, and the Abbot of Saint-Denis has the custom of handing it over to the king whenever he takes up his arms and goes to battle. 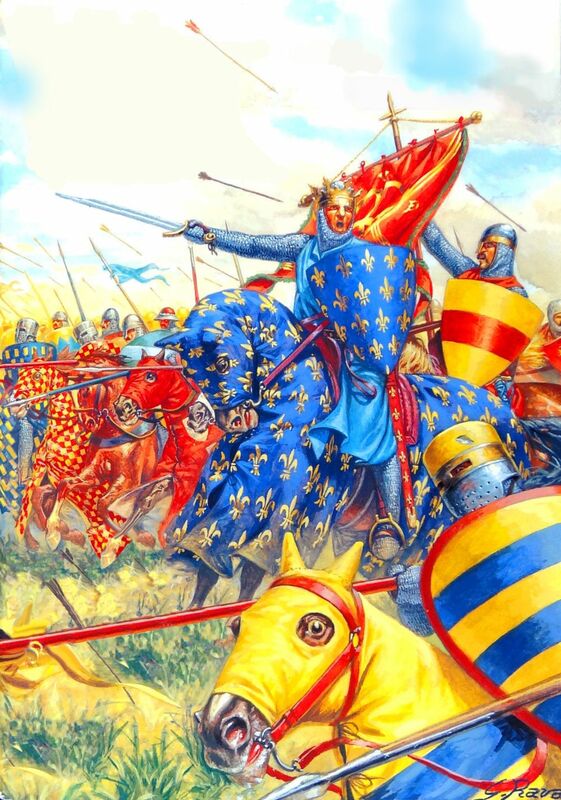 The royal banner was carried ahead of the King by Galon of Montigny, a man of strong body." Elsewhere, the king's banner is described as the usual blue with fleurs de lys. Note that this is in the style of an ecclesiastical banner and vexilla style vertically hung banners usually are. Gonfanon was originally used for a banner with streamers but usually flown horizontally, as on the Bayeux tapestry. Heath says that such banners were the preserve of the upper nobility, with size and number of streamers sometimes indicating seniority. They were likely influenced in style by the similar Byzantine flags. I doubt that militia would carry the vertically hung gonfanons unless they were carrying an ecclesiastic flag. I gave a banner of St Paul to my London militia of this type. I doubt that Low Countries militia would have used a vertical gonfanon – they didn't a century after Bouvines and though fashions changed in that century, it was generally through the adoption of tall rectangular flags that got increasingly squarer. In Italy, where the standard bearers in a city area could be called a gonfalonier, the flags tend not to be shown as vertically hung gonfanons until quite late. Even the carroccio flags are usually shown as long horizontally flying streamers. Much later than Bouvines, the TK flags at Tannenburg are made in a way which makes them look like they would have hung verically, but apparently even those were almost all flown normally. You get the same thing as late as Spanish militia flags in the Napoleonic Wars – the suggestion is that it allowed the flag to be hung decoratively one way (e.g. as a recruitment point in Spain) allowing the features to be seen when not being blown by the wind or streaming behind a rider, but then to be carried in a normal flag way in battle. Thanks Swampster, looks like it might be a stretch to have one out there. I might do it anyway, but not sure yet.